Fit for a prince, our Gold Jacquard Premium Spats make a opulent statement on your shoes. 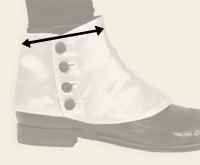 Initially created to prevent mud and debris from getting in lower-cut shoes, spats evolved over the Victorian era to be a dandy-looking addition to the gentleman’s wardrobe. This pair of decorative spats is cut from a tone-on-tone jacquard print polyester fabric with a cotton lining. A black elastic stirrup keeps them in place and 4 covered buttons make on and off a breeze. Dry clean only. Imported Available in sizes S-L. Ordered a pair of these to dress up my Formal Hufflepuff outfit and they're great! In the past I've only be able to find cheap, vinyl costume spats which, while effective, have also been rather uncomfortable. These were much more comfortable, especially about the ankle (I have just over a 9" ankle and ordered a pair in small), and look smashing! I'm already looking at different styles and colours. Matches my smoking jacket perfectly! Well made, good fit, good selection and decent prices. Hard to beat. I ordered a dress on a Monday, needing it the end of the week-hopefully. I called to ask if possibly the dress could/would arrive on time. It arrived two days later! Wonderful! Historical Emporium is a wonderful site! There customer service is fantastic and they are quick to respond to questions or concerns. I've really never had a problem with this site. 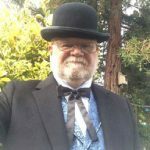 I think victorian men's fashion is so much more stylish than contemporary drab work fashion and I wear Historical Emporium clothing as part of my everyday ensemble. I have been delighted with everything I have ordered. I have found their clothing to be well made, quality pieces at reasonable prices. I am a returning customer and Historical Emporium has become my primary clothing resource. Your products are excellent and very well made. I am constantly looking at your site for new items! Had a question about how to shape one of the holsters to conform to my pistol. The customer service rep knew exactly how to solve my problem. Her explanation about the construction of my holster allowed me to "fix" mine in about 30 seconds. First class all the way, both product and people.